I somehow ended up adopting or buying myself a new pet today. 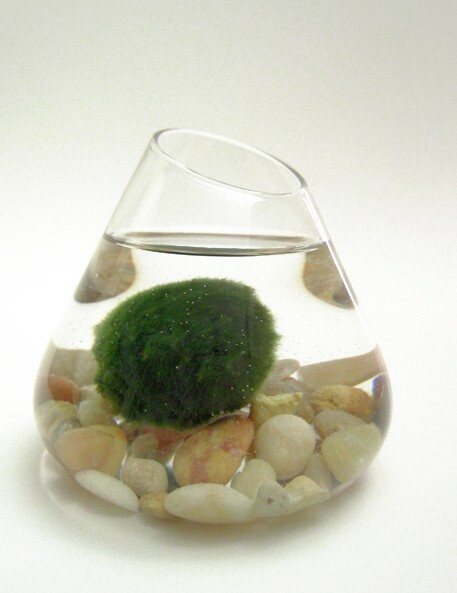 A Marimo ball. Marimo (a.k.a. moss ball) is an endangered species of filamentous green algae originally founded in its natural habitat in Lake Akan, Hokkaido but it has now become a popular domestic plant that can be purchased at souvenir shops. Legend has it that Marimo can bring love, luck and happiness to those who nourish it with love and patience. So hopefully, my pet Marimo which I call "Baby Emerald" will bring me love, luck and happiness.... It's small and in a bottle with some tiger eye crystals. I probably might get it a small aquarium to put it in. the Rapid-Span, Supa-Span, and Alu-Span range of products, these structures are all easily disassembled and cartable making them excellent for interim facilities with resale options. plague (love those germs) and an earthquake (shake, rattle and roll) as punishment for rumblings in the ranks. realize the potential of the Internet. Once you start packing with regular newspaper, 2 primary disadvantages become quickly apparent.